Patellofemoral pain syndrome is a general term that describes pain in the front of your knee, behind, or around your kneecap (patella). It’s thought to be a result of stress on the joint between your kneecap and your thigh bone (femur). Patellofemoral pain syndrome is sometimes called ‘runner’s knee’ because it’s particularly common in people who run or do other sports. The condition is one of the most common causes of knee pain, causing around one in four knee injuries seen in sports medicine clinics. Although anyone can get it, it’s more common in women and in young adults. Patellofemoral pain syndrome can affect one or both knees. The main symptom is a dull, aching pain, which you feel at the front of your knee, around and behind your kneecap. The pain starts gradually and usually gets worse if you do a lot of activity. It may be especially painful when doing activities where you need to bend your knee, such as going up and down stairs, or doing squats. It can also be painful when sitting with your knees bent for a long time, for instance in the cinema or on an aeroplane. You may get crackling or crunching sounds in your knee when you bend or straighten it. It’s unclear exactly why some people develop patellofemoral syndrome. However, it’s likely to be caused by a combination of factors. It often develops as a result of overuse – for instance, if you have repeated stress on your knee during sporting activities. It can also be triggered by a sudden change in how often you exercise, or how long you exercise for. You’re more likely to get patellofemoral syndrome if there’s a structural problem affecting the joint between your kneecap and thigh bone. This can include minor problems in the alignment of your knee joint and weakness in the muscles around your hip or thigh. These problems can affect the way your knee joint moves, causing pain. The initial treatment for patellofemoral syndrome aims to reduce your pain. You can do this by reducing activities that cause pain, using ice and taking medicines to reduce pain and inflammation. Further treatment includes stretching and strengthening exercises with physiotherapy to gradually get you back to your usual activities. Most people take about four to six weeks for their symptoms to resolve. You should reduce the amount of any activity you do that is causing your pain. If you have any swelling, applying an ice compress to the affected area may help. Try applying it for 15 to 20 minutes at a time, every two to three hours. This may be especially helpful after you’ve been active. Don’t apply ice directly to your skin as it can give you an ‘ice burn’ – place a cloth between the ice and your skin. You can buy certain non-steroidal anti-inflammatory drugs (NSAIDs) such as ibuprofen over the counter. You may find these helpful for short-term pain relief of patellofemoral pain syndrome. Your GP may be able to prescribe stronger NSAIDs if you need them. Always read the patient information that comes with your medicine, and if you have questions ask your pharmacist or GP for advice. Making sure you follow any physiotherapy and rehabilitation programme you’re given will be an important part of your recovery. 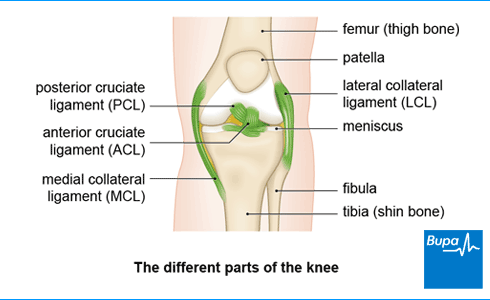 Your physiotherapist will carefully assess your knee, and then plan an individual programme of rehabilitation exercises. These will help strengthen your knee and leg muscles gradually. These may include stretching and specific strengthening exercises, as well as exercises to improve the range of motion of your knee. Your physiotherapist may also suggest trying manual therapies, such as massage or manipulation of your knee joint, to help improve your symptoms. They may suggest wearing orthoses. These are special inserts in your shoes, which can help to reduce your pain and improve your function. You can buy these from a pharmacy or online. Your physiotherapist can advise you on what to buy or may refer you to see a podiatrist to have them fitted. Your physiotherapist may suggest taping your knee or wearing a support brace to help with pain, before doing your exercises. It’s unclear how effective these supports are – but they seem to be helpful for some people. Surgery is not usually used as a treatment for patellofemoral syndrome. It may very rarely be offered as an option for some patients who have severe, persistent pain, when other treatments have failed.